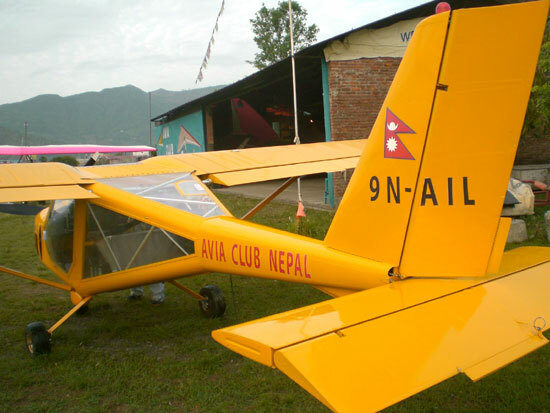 If you ask me what the most memorable day of my life is, it would have to be when I hopped on a two-seater Aeroprakt of Avia Club in Pokhara for a one-hour flight through heaven recently. 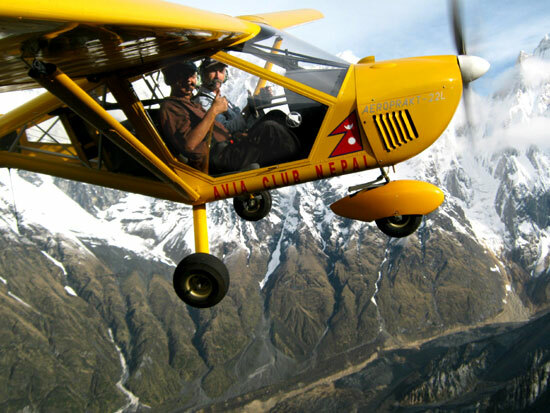 The Ukrainian-built Aeroprakt is like a toy plane, and seemingly as easy to fly. 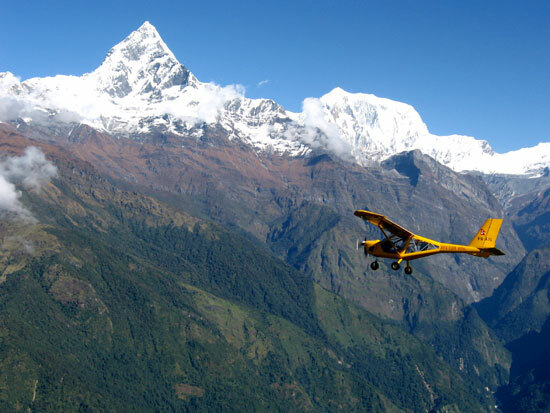 We take off effortlessly from Pokhara airport and nosed towards the south wall of Lamjung Himal. This is our “self-portrait” with a canon Cybershot mounted on the wingtip. 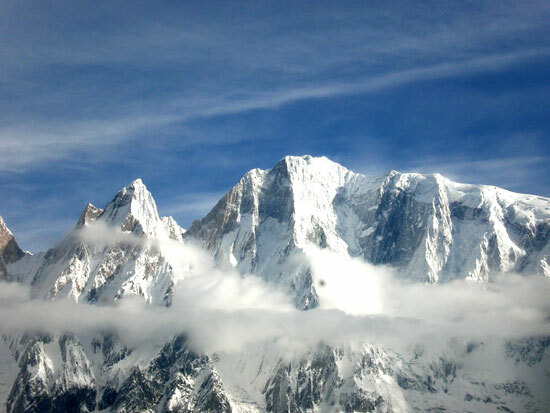 We climb to cross the knife-edge ridge that separates the Mardi and Seti valleys, a herd of Himalayan tahr, perfectly camouflaged in the blonde grass, scurry up the slope. The pilot points at them and makes a climbing circle to fly past. The alpha male is glaring at us from an outcrop, and we can actually see his anxious yellow eyes as we whoosh past. It all happens so fast, and being eye-to-eye with goats at this altitude is so mesmerising that I forget to take pictures. You have to take my word for it. However, I did take this picture of the saddle where we saw the tahrs with Machhapuchhre behind. The upper reaches of the Seti Valley must be one of the most desolate places in the Himalaya, and a paradise for geologists. 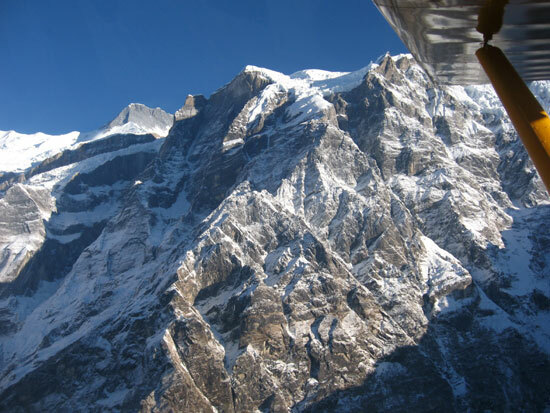 The exquisitely chiselled face of Annapurna III catches the morning sun, exposing its pink schist. 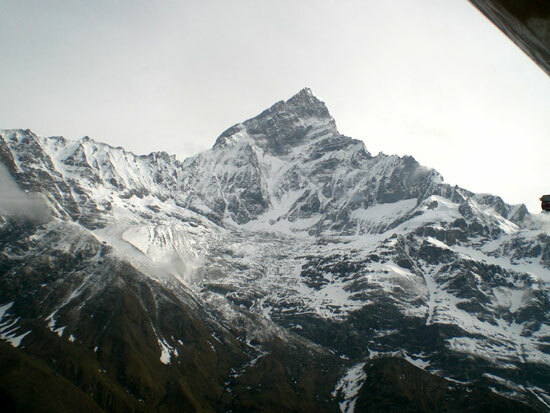 We then fly west past Machhapuchhre, its familiar pyramid shape foreshortened by being right under it. We cross another ridge to descend into the Modi Valley, passing a line of water buffaloes being taken in single-file like ants up to high pasture. From this vantage point, we see why the stretch near Deurali on the trekking route to Annapurna I Base Camp is so treacherous: it is right on the path of avalanches that come off the eastern face of Hiunchuli. It is time to head back. We put Sarangkot on our sights and descend. Flying under a Jomsom-bound Dornier we come over Phewa, make a 360 around the Peace Stupa and then down for the landing. Hey, Dixit, now you are really making me envious, man. Truly brilliant, I am going to do this. You are one heck of a guy. 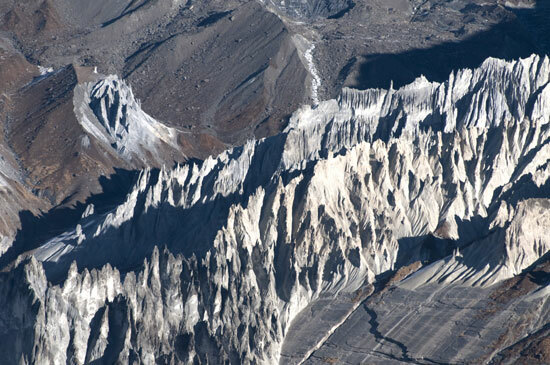 Kunda Dixit is right that these are relics of a massive aggradation after the catastrophic debris flow in historical times from the west face of Annapurna IV. But it was probably about 500-700 years ago, not 1,000. 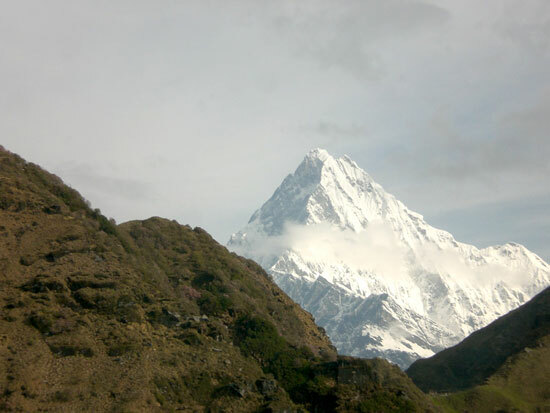 While the geomorphology of the Pokhara basin has been studied, and the earlier theory that the alluvial accumulation there was caused by a lake like Kathmandu Valley has been discarded, there is relatively less study of the headwaters of the Seti above Sabche. Existing evidence point to catastrophic sediment deposition during the natural impounding that later lithified on top the existing bedrock. This conglomerate, as seen in the picture above, have now been deeply incised by erosion. The lesson from all this, of course, is what would happen to Pokhara and the other infrastructure and urban areas downstream if there was a similar seismo-tectonic event on the upper reaches of the Seti or Mardi today. This takes on added significance because of the 300 year seismic gap in the western Nepal, and the possible impact on the Annapurnas of an 8 richter earthquake. great pictures and lively narratives. Thanks for sharing that heaven on earth with us. Truly awesome!!! Its really awesome. I hope I would get this kind of experience one day. Thanks for sharing. Want to facilitate you for these CREATIVE write ups about Nepal. I have seen a huge generator in Jagadamba Press which shows your effort to stay in Nepal and do something for the country. I suggest to compile your write ups and publish a book i am sure it would come out like V.S Naipul’s “among the believers”.